No not Valdez in Alaska or Niseko in Japan but the spa town of Cauterets in the Pyrenees. Normally better known for its suphur smelling waters the town has been battling against snowmaggedon since the New Year. Anyone who has followed our snow reports will have noticed that the avalanche risk in the area has seemingly been stuck on “High”; that is because the area has seen over 7 meters (that’s 276 inches) since the start of January. Yesterday there was 550cm of snow at the top of the pistes officially making the ski resort the snowiest in the world ahead of Mammoth Mountain in the USA with just 490cm. Engelberg in Switzerland is also having a good season with 450cm of snow depth. Cauteret locals say it is the snowiest winter since 1986, a result of global warming, warm moist air bringing more snow than cold, dry air. It is not all good news. 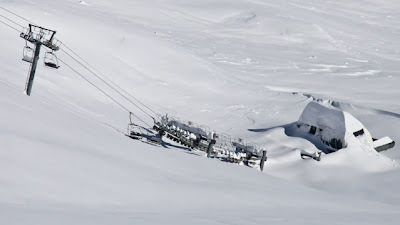 Since the start of the year winter sports enthusiasts have been cancelling trips to the Pyrenees due to problems with access and then problems actually opening the runs and ski lifts. A number of competitions and events have also been cancelled or rescheduled. So scarry though. Any updates on how’s the snow condition in Cauterets, Pyrenees? Is it safer now or still in same condition? It’s great to spend vacation in this mountain but it’s better to be safe and away from any avalanche. Rather stay at home or not, better to choose other safer mountain to ski.